Our hearts go out to our many friends who have suffered through Alaskan-style winters this year. We pray that you remain safe and warm. We’ve had our share of snow and cold, as you can imagine, but it is something we’re accustomed to and something we prepare for. Chances are we won’t see a melt until late May. Thanks to your help, we are meeting our bills now, though just barely. We send you our deepest appreciation and our prayers for your generosity in helping the remote people whom we serve. A WONDERFUL EXAMPLE: (left) Inupiat (in-OO-pee-at) Eskimo elder Betty Segock poses in her home in the village of Elim, 94 miles east of Nome. Betty is a woman of character and energy. In Elim, like most other villages, the possession of alcohol is illegal. Years ago, Betty would travel to Nome to drink heavily. She didn’t think much about what she was doing, though she was repulsed by the sight of others who were intoxicated. One day, she saw one of those chronic alcoholic men sober, singing at a religious service. She was inspired to pray, and was rewarded by faith in God, and grace that gave her the strength to turn her own life around. Amy’s transportation was donated by Bering Air, a local bush airline. Thank you so much for helping us share inspiring and valuable stories like Betty’s with tens of thousands of our far-flung listeners. (Left) The village of Elim on a cloudy afternoon. (Left) The next morning, stars shine behind an Elim home. CAN WE TRANSLATE THAT? For over two years, we’ve had construction permits to build 11 “translators,” the F.C.C. term for remote 10-watt transmitters to carry our signal. The stumbling block has been the cost of sending our audio signal to them: AT&T wanted $100,000 a year! Last month, KNOMer Tom Busch attended a seminar to become a certified installer of small satellite systems that will cost much, much less. We’re still working out details and will provide you with more information next month. Please stand by! INSPIRATIONAL SPOT: Humility is truth. It’s not pretending to be what we’re not. It’s realizing that we are children of God, and we owe everything we are to God. 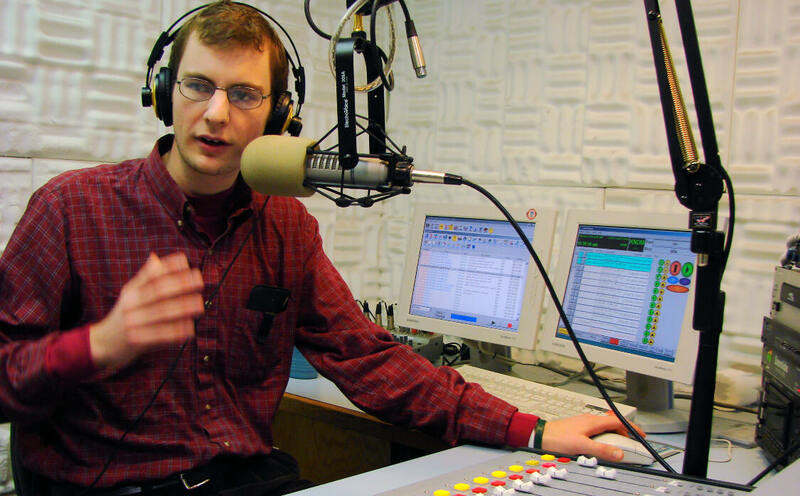 VOICES: (left) Volunteer news reporter Jesse Zink anchors a KNOM “Sounding Board” program from Studio C.
Thanks to your support, these shows allow listeners to respectfully share their ideas on many of the issues and problems which face the people of our region. Past programs have dealt with subjects like child sexual abuse, alcoholism, teenage pregnancy and suicide, to name a few. The topic of this February show was elder services and care. In rural Alaska, seniors are most commonly known as “elders,” a term that embraces the reverence with which they are regarded. It was a spirited and heartfelt discussion. 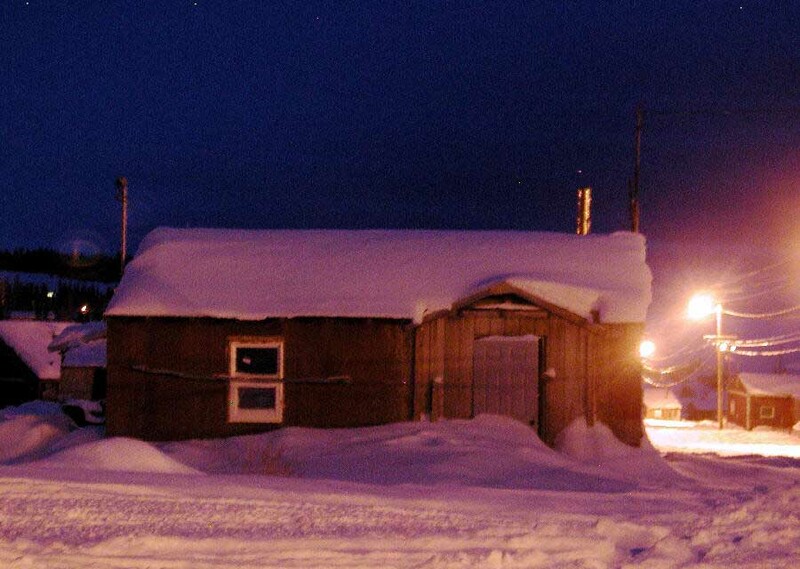 Callers expressed dismay that due to declining government funding, it is increasingly difficult for elders to afford transportation to larger communities like Nome, where medical diagnosis and treatment are available. Several talked about caring for their parents at home, and how difficult that can be at times. They noted, however, that the work is important because of the respect and love they feel for them. Callers praised elders for their contributions to culture and society, and agreed that however burdensome it may seem to tend for them, the elders’ lives in the old days were far more difficult. RECENTLY HERD: In February, just outside of town, the Nome high school ski team had to divert course after encountering a herd of several hundred reindeer that refused to relinquish the right-of-way. 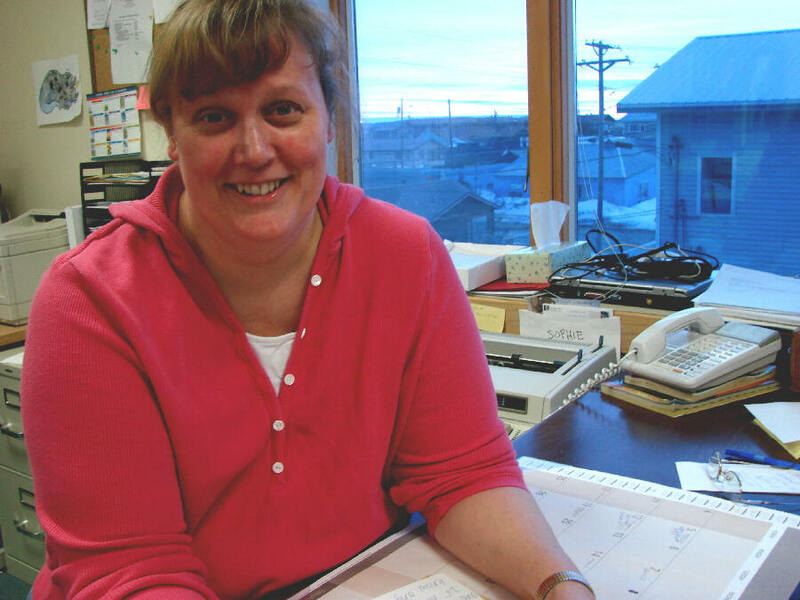 THE OLDEST CATHOLIC RADIO STATION IN THE UNITED STATES, KNOM labors to improve the lives of Eskimo, Aleut and Athabascan Indian villagers, scattered throughout 100,000 square miles of road-less Western Alaska. We provide the Mass and Rosary, inspiration, education, encouragement and positive companionship, 24 hours a day, entirely thanks to you. INSPIRATIONAL SPOT: God promises us a safe landing, not smooth sailing. INSPIRATIONAL SPOT: Whatever comes my way today, I ask for the grace to bear it. To keep it to myself if it’s bad, and if it’s good, to share it. Some radio stations use fancy computers to alert call-in hosts to incoming calls, but at KNOM, we do it using scrap paper and magic marker. Here, volunteer Ross Reilly screens calls for Jesse Zink’s “Sounding Board” from adjacent Studio B. “800” tells Jesse to select the station’s toll-free line, and “EMO” is shorthand for “Emmonak” (eh-MAHNG-ek), a Yup’ik Eskimo village located on the Yukon River Delta, about 123 miles southeast of Nome. IT HAS TO BE PRETTY BAD for the town of Nome to shut down. Blizzards? Snow drifting above the roof? People here take such things for granted. They’re used to extreme weather and have learned to carry on during storms that would paralyze most communities. Last month, however, heavy snow and wind caused all businesses and offices to close down for a day. If memory serves, that hasn’t happened for about fifteen years. At our remote transmitter site three miles down the coast, power went off for 65 hours, but thanks to the mission’s standby generators, KNOM remained on the air continuously, broadcasting news and emergency information. SINCE OUR MISSION’S INCEPTION, our role has been to provide quality Catholic radio to people who especially need it, and to people who ordinarily would not tune in to a religious radio station. In addition to Catholic programming, we are the entire region’s only timely source of news. We play popular music, from the 1940’s to the present day, and we sprinkle our days with educational and inspirational spots. Our signal can be heard over long distances, and we have heard from listeners in Russia, whose coast is only 160 miles away. 97% of our operating funds are from gifts by good people like you. Thank you for caring, for your financial support and your prayers. WILLFULLY: Please consider adding KNOM to your will. We prayerfully place all bequests into funds that will only be used for major capital improvements, and to weather the mission through emergencies. INSPIRATIONAL SPOT: As we go out to take God to others, know that we will meet Him through them. INSPIRATION: (left) For KNOM business manager Lynette Schmidt, the inspiration to become a KNOM volunteer came during soils class at the University of Washington. She was a botany major. Lynette’s older brother Normand, a Brother of Christian Instruction, had been at the mission for seven years. 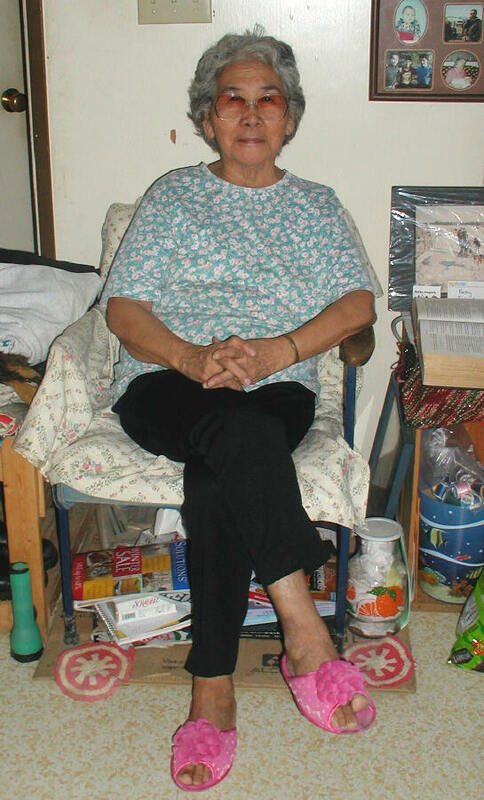 Lynette, then, was a volunteer from 1982 to 1985. It was there that she met future husband Ric Schmidt, now KNOM general manager. With Ric, she returned in 1995, first as inspiration director and office assistant, becoming business manager two years ago. She and Ric have six children; the second oldest, Jenna, graduates from high school this year. In addition to working at KNOM, Lynette home schools her children. We thank God for her selfless service to our mission! FORTY YEARS AGO: March 1967’s snow is so deep that for daily Mass at the Little Sisters of Jesus’ chapel, worshipers walk through a tunnel to the front door. THIRTY YEARS AGO: The first day of 1977’s spring awakens to –25�, which is not unusual for Nome. KNOM volunteer announcer Mary Pat McElligott enters a local sled dog race and to her surprise, wins a trophy for coming in third. WE HOPE that by the time you read this, your spring will be well on its way. Ours may take a little longer. We think of March 1993, when five days of continual blizzard completely filled in 30- and 40-foot deep gullies on the tundra. We never tire of saying that you are our strength. Our staff are “in the trenches,” but it is your help and your prayers that keep our work alive. We thank you for your generosity and we honor you for it. In return, we keep you and your intentions in our prayers, at every staff meeting, and personally as well. May our Lord bless you and those you love abundantly.